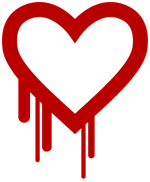 The OpenSSL heartbleed vulnerability CVE-2014-0160 has been all over the news this month. I posted an overview on what to do and how to detect exploit attempts. Generating new certificates is one of the advices to cope with this vulnerability. A new certificate means that you have to revoke the old one. Revoked certificates are ‘announced’ in a CRL, or a certificate revocation list. SANS ISC has a graph on certificates revoked per day. This graph is based on different sources. I am only interested in the CRL revocation data of Terena. Below are the graphs for the Terena CRL list. It is generated with a Python script (see below). You can see a spike shortly after the announcement of the Heartbleed bug but I would have expected to see a higher number of requested revoked certificates. The Python script generates a JSON file that is used to feed a Google Chart. It uses a file TERENASSLCA.crl.parsed that is the output of parsing the CRL file through OpenSSL. if pos > 0 :        # A line indicating a revoked certificate? json_line = json_line + " , "
How did you make the graphs? I fetch the CRL; parse it with OpenSSL and then the python script parses it to create a JSON file. The graph (+table) itself is made with Google Chart.